November: The days are getting shorter, the temperatures drop and going outside seems less and less attractive. Some of us however, would still like to go out and experience Prague like a local, finding places to hide from the winter winds and enjoy their time. Some people say there is nothing else to do than drinking delicious beer when Prague goes into a winter slumber. This however is far from true: There is heaps of things to do and experience, even when the numbers on the thermometer drop. Although the beer gardens might be closed and Náplavka is haunted by a bristling breeze, there are places to go and spend time in the cozy warmth. We found 4 fun indoor gigs to discover this winter, which will not only give you a local’s experience but also go easy on your wallet! Got musical talent and want to show others what you got? 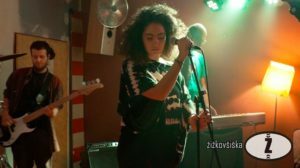 Then Žižkovšiška’s Open Mic Night is the perfect – reoccurring – event for you! Žižkovšiška provides musicians and other talents with a space to play in front of a crowd. How you get your moment on stage? Simply sign up at the place upon arrival and you are in! The spaces are limited to 12, so make sure to get there early enough and have a beer from the tap to fight the stage fright! Not only musicians and entertainers are welcome; listeners are just as important! 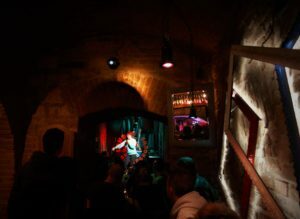 If you wonder what Prague’s talents have got, check out the Open Mic Night at Žižkovšiška and enjoy a wonderful evening full of fun and new people to meet! 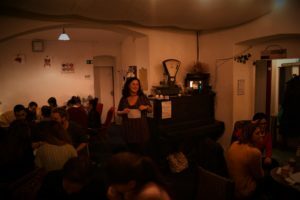 Have we mentioned that Žižkovšiška also hosts Sunday Soup & Jam Sessions? 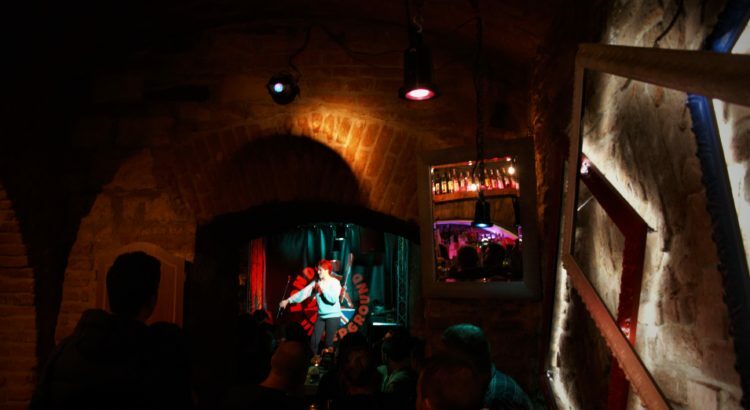 Every Sunday, you can get a bowl of delicious soup and some awesome tunes on their premises, which makes the buzzing place in Žižkov the perfect place to hang out during the cold winter months. Read more about it in this article! Tricky questions to answer and great prizes to win, in a place full of secret rooms; this is Trivia at A Maze In Tchaiovna! 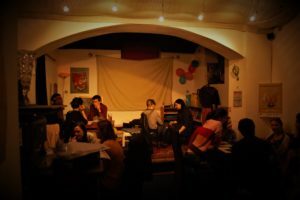 Every second and fourth Wednesday of the month, fellow Trivia quizzers pilgrim to the tea house located in Hradčanská. Whether you arrive with your friends or as a fellow quizzer alone; everybody is welcome to join in and will have a spot in one of the teams that are competing for cool prices. Your team made 3rd place? All of you get to choose a book from the mystery box to read and enjoy when it is too cold to step outside. Second placed quizzers are rewarded with a round of beer for the table! The participants that prove to be the smartest cookies in the room get a voucher for tea (4 people) and get to munch on two yummy vegetarian pies. Next to offering wonderful entertainment, A Maze In Tchaiovna also offers a wide selection of perfectly brewed tea as well as tasty beer from a microbrewery. Are you ready to answer tricky, fun and interesting questions and meet new people? Then you should mark the second and fourth Wednesday of every month as booked for ‘a big portion of fun’ at Amazing Trivia! Boards and Brews, established in 2017, is the perfect place to spend a cold and wintery day at. Whether you want to go enjoy a game of Cards Against Humanity with your friends or get strategic with your coworkers. With more than 500 board games, Boards and Brews offers the perfect and fun hiding spot from the cold. And because you should not play on an empty stomach, the place offers snacks and meals, too! Naturally, they are never short on beer either. BB&B makes the time during which beer gardens are closed enjoyable and fills it with a good portion of fun. Are your friends not into board games but you would like to game away the day anyway? Bohemia Boards and Brews even thought of a solution for that! Their open gaming nights invite all board game fans to come and hang out, meet like minded people and enjoy a jolly good time at their place. Calling all hobby detectives! Some of you might remember the days when you went on fox trails with your company or school – and have fond memories of them. Cryptomania specialises in creating paths through the city and beyond that will let you discover Prague from a whole different angle. In a team of 2-5 players, you will find yourself confronted with cipher and logical tasks to obtain passwords. Passwords that will lead you to the next hint of where your journey is going respectively what your next task will be. Other than fox trails, Cryptomania’s difficulty of the games are especially constructed for adults and thus harder to crack. With patience, willingness to find different ways of solving a problem and lots of creativity you can break the cipher while learning more about the city and its mysteries. If you and your friends want to spend an afternoon to solve royal mysteries, discover the lost Jewish Town or want to explore Brno and its history, Cryptomania is the activity for you! Hints are less than obvious and you will need a good portion of thinking outside the box along with team work. To enter the game you simply visit their website, choose your game and purchase it. Every game has a starting point, mentioned in the details of the game (along with needed equipment and difficulty). 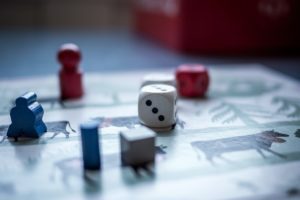 Though currently only 5 games are available in English, the game range in Czech is broader and also a fun way to practice and learn the language! “That is all good and well, but is this not an outside activity?”, you might ask now. While the cipher games are usually outdoor activities, Cryptomania can create cypher games for indoor purposes, too! This means you can be Sherlock Holmes in the comfort of your or a friends house, too! Happy mystery solving! Laughing brightens the mood and strengthens the tummy muscles! Therefore, you should definitely go check out the ‘Comedy Cellar’ at the London Underground Bar. Every Friday, the guys from London Underground invite funny and witty comedians to make you laugh till you cry. 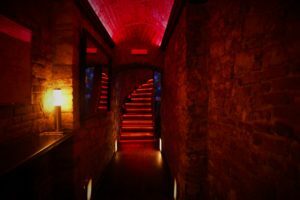 Not only is the bar absolutely stunning to look at, visiting the Comedy Cellar is for free! There truly is way more to do in Prague than just drinking beer and enjoy the magical winter views from one of the gardens: Mystery solving, competitive question answering, strategic thinking and laughing out loud at one of these wonderful, reoccurring events, for instance. Are you ready for a different kind of winter activity when in Prague? Have you checked out any of the places or have more cool places to spend the winter days at you want to share? Let us know in the comments!